Fig. 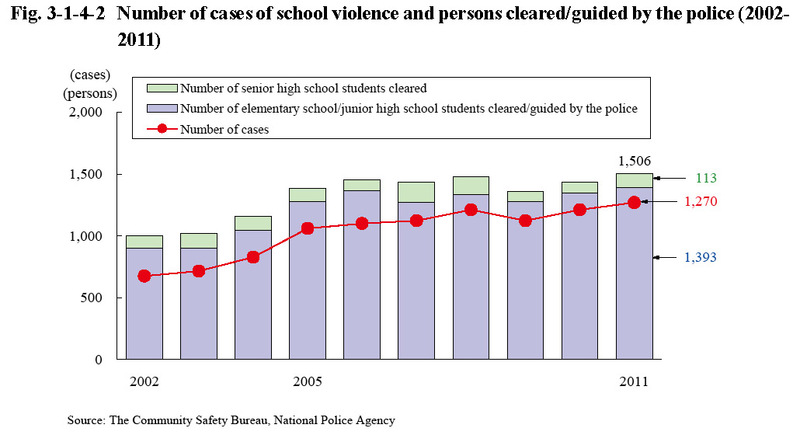 3-1-4-2 shows the number of cases of school violence and persons cleared/guided by the police over the last 10 years. The number of cases reached a peak of 2,125 in 1983 and the number of persons cleared/guided by the police reached a peak of 10,468 in 1981, and then both started decreasing to be 448 cases and 897 persons in 1996. The numbers were both generally increasing in recent years, however, and were 1,270 cases (up 4.9% from the previous year) and 1,506 persons (up 5.0% (id.)) in 2011 (See the Appendix for details). Examining the educational status of juveniles cleared (guided by the police) revealed that junior high school students dominated in number each year. In 2011 the number of junior high school students was 1,366 (90.7%), followed by that of senior high school students at 113 (7.5%) and then that of elementary school students at 27 (1.8%).